Kos is the perfect place to take a holiday with kids. You can combine the beach experience with water parks, volcanic weirdness, amazing sunsets and insistent peacocks – and they’ll love every minute of it! So here are my Top Ten Kos experiences that I’ve never found anywhere else in the Med. At Embros Thermes, the island of Nisyros a live volcano heats the water below ground to boiling point, which then seeps out through cracks in the rocks into huge pools by the sea and mixes with the cold sea water to produce a very pleasant bath, super-charged with sodium, potassium, magnesium and calcium (so great for your skin). The kids and I went at night – it can get too hot during the day, and a dip is always more fun under a starry sky – then enjoyed a bite at one of the great fish restaurants directly beside the pools. High up on Mount Dikeos, the village of Zia is engulfed in woods, and humidity from water rushing down the mountain produces a cooler atmosphere here, making it the perfect spot to take refuge from the sweltering summer heat. Work up an appetite with a walk in the woods of fir trees. In the evening, go to a taverna named Sunset Balcony, order a ‘traditional tomato sweet’ (they preserve the tomatoes to make them sweet, like glace cherries, and serve them with thick Greek yoghurt and honey) and take in the blood-red sunset. There’s probably no better way to entertain the little ones on a hot summer day; there are several water parks on Kos, but my kids’ favourite was Lido, where they would always head straight for the Kamikaze slide. They loved it; I couldn’t bring myself to go anywhere near it. Kos is an open-air museum that even kids will enjoy. A few minutes’ walk from Kos Town centre, you can wander through Roman remains in the Western Excavations, and get a real feel for the time. They’re all gloriously free and open, and covered in trees: we used to like wandering through them enjoying a picnic or drink in the shade of the old buildings. Flowers are everywhere you look on Kos: when the kids and I were there, we used to like walking into Kos Town centre in the morning, when it was still quiet, ordering breakfast at the coffee shop just opposite the Gate of the Forum, and enjoying the explosion of natural colour and smells. Kastri Island is at the eastern end of Kamari Bay, opposite Kefalos Beach, and used to guard the bay from pirates. These days its only inhabitants are a church and wet tourists – if you’re a reasonably good swimmer, you’ll be able to swim or snorkel across, and make your way to the tiny church, where tradition dictates you should ring the bell. Paradise Beach, a ten-minute drive from Kardamena, has a strange phenomenon that has earned it an unofficial name: Bubble Beach. Swim out towards the red buoy, dive underwater, and you’ll see huge columns of densely-packed bubbles coming out from under the sand in a vast natural jacuzzi. The kids love walking and swimming in amongst the walls of bubbles (volcanic gases coming up from beneath the sea floor). Take a boat trip to the wild island of Nisyros, an hour off the coast of Kos itself. The whole place is actually a live volcano (perfectly safe, mind) where you’ll be walking on the floor of the crater. Take a walk from Mandraki, the island’s harbour and capital, through the crater and up to the mountain village of Nikia – but remember to wear mountain boots or shoes with thick soles, as the floor can get hot enough to melt rubber soles! One the kids will just love: Plaka Forest is a magical pine forest, hidden away, with a cool and shady woodland area at its heart that’s actually a sanctuary for feral cats, turtles – and 50 tame peacocks. The peacocks will love you forever if you go and feed them bread, cookies and the like. Your kids will adore them. The clean, cool air and quiet atmosphere of the forest makes it a great refuge from the beach and hustle and bustle of the resorts. 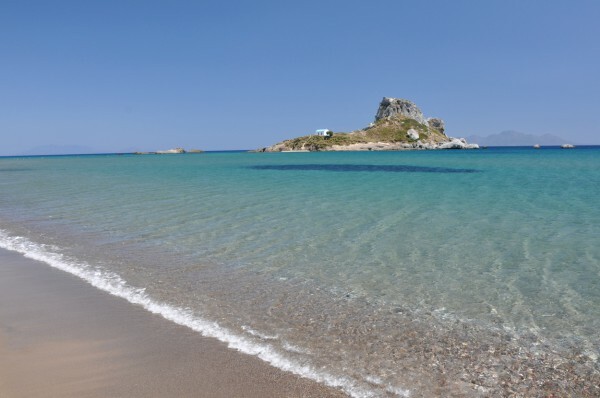 Tigaki Beach is relatively close to Kos Town (about 15 minutes’ drive), and one of the best places to enjoy a refreshing swim, water sports and great sunbathing. The white sandy beach here is miles long and has won more blue flags than you could count for its clear, shallow waters and cleanliness. Totally child-friendly. This post was supplied by Sandra and Andrea, the founders of a Single Parent Travel site. Single Parents on Holiday is offering single parent holidays to Kos this August.